The Mississauga Career Fair is one of the largest and most interactive career fairs in the GTA – with over 200 exhibitors across our four events in 2018. Job seekers can network with top employers in the GTA and apply to hundreds of available job openings! Jobs available in: Accounting, Administration, Customer Service, Business Development & Marketing, Education, Finance/Banking, General Trade/Labour, Hospitality, Human Resources, Logistics & Transportation, Warehouse, Retail, Security, Information Technology and more! The Mississauga Career Fair is on Wednesday, February 27th, 2018 at Living Arts Centre. Click HERE to register or learn more about the event. Those who complete the following three steps will be entered to win. One winner will be drawn at random and contacted through the social media account that was used to enter. 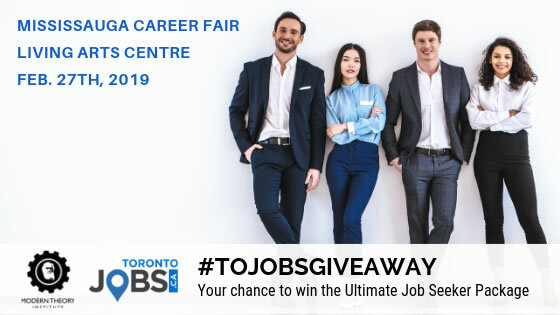 ALL CONTEST ENTRANTS WILL RECEIVE EARLY ACCESS TO OUR MISSISSAUGA CAREER FAIR ON FEB. 27TH, 2019. 3. Contest participators will be entered into a random draw. 4. Prizes can not be redeemed for cash value. 5. Other conditions may apply.